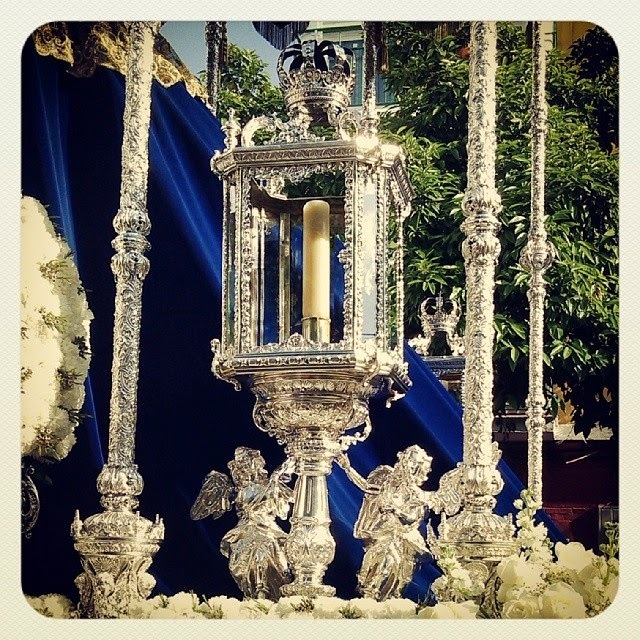 On Saturday, the day before the Holy Week there were four processions on the agenda in Seville. We started with a new brotherhood, the St. John, the Worker. We had to go out of the centre to see it which meant there weren’t many tourists around, we certainly didn’t spot any other foreigners. This was our first, ‘proper’ procession and we LOVED it! The atmosphere was completely different to the one we saw the night before. It started in the afternoon and had a very local feel to it. It seemed like everybody knew everybody and by some magic they seemed to recognise everybody under the nazareno outfits! Every time the procession stopped the parents ran to their children to give them food and drink, daddies took selfies with their nazareno children and groups of pointy hats gathered for a quick goss. I use this opportunity to talk about the order of the procession. I won’t go into details (there is way too many roles and terminology for that!) but will outline the main parts, that are generally the same in every cofradía. First comes the Cruz de Guía which is carried by a nazareno. Then come a group of cone shaped heads. They usually put children here. They are very sweet, trying to look all grown-up, wearing their nazareno outfits. Here they all had a giant candle which wasn’t lit so most of them used it as a walking stick or rested their chins on them while waiting. Then come the ‘altar boys’ who are small children and carry a basket full of sweets which the children in the crowd ask for from them. Here’s a little nazareno who is so small that he needs his mummy to go with him. There’s another little one in front of him, asking for a sweetie. Then some more, adult nazarenos. 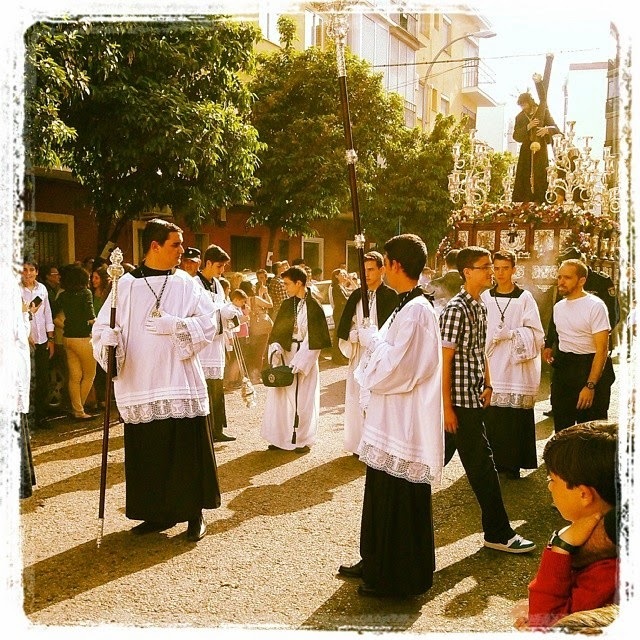 Behind them the older altar boys who instead of baskets carry incense burners. And finally, the paso itself, which here represents the Lord of Charity. In front of the paso goes the ‘llamador’. He has an important part as the people who carry the float from inside, the costaleros, cannot see anything! The llamador has to guide them by hitting the front of the paso or by shouting instructions for them. 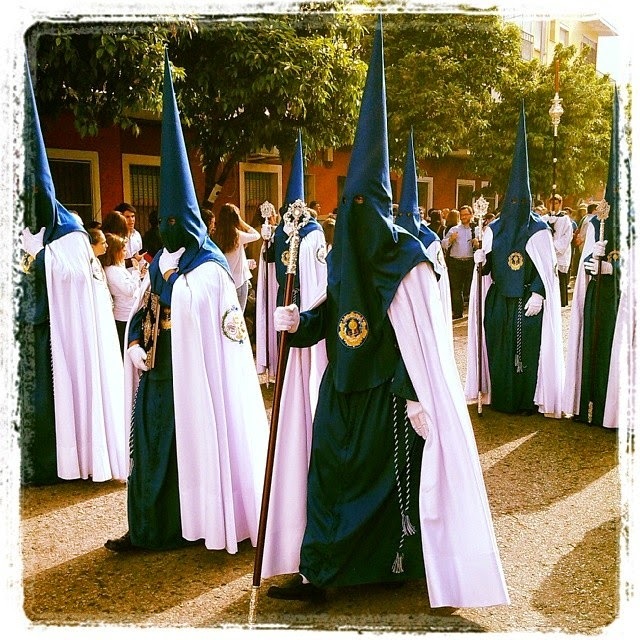 Behind the paso there are the ‘serious’ nazarenos, the penitentes carrying crosses. Then the brass band which plays the rhythm for the costaleros’ steps. As far as I could see the order is the same for the second paso which is the float of the Virgin Mary. 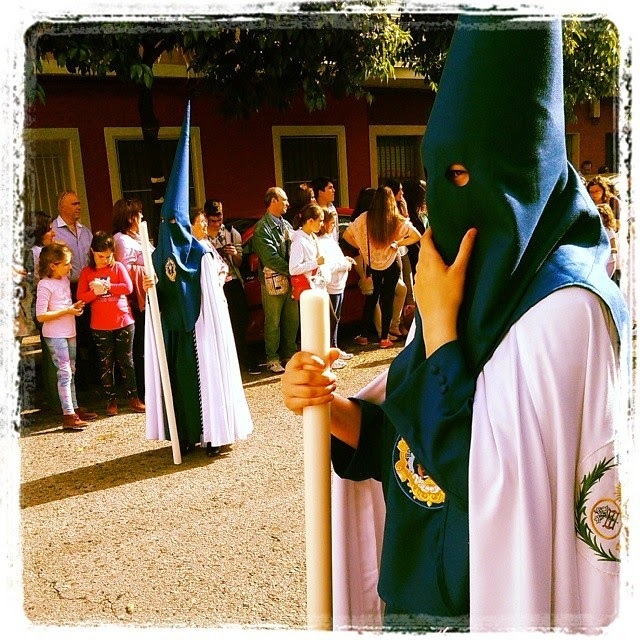 The nazarenos’ tunic is always the same colour as the colour of her cape. We really enjoyed this procession. It was out of the way so there was not too many people watching, we were able to see everything right from the first row. It was all calm and had a family-feeling which was missing from ‘the big ones’ during the Holy Week. We are very happy that we could be there to see it.